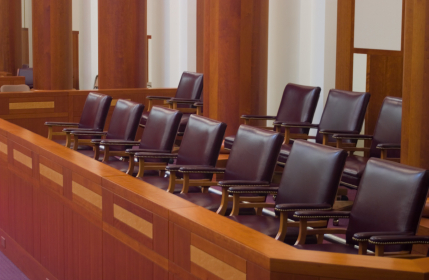 The process of selecting a jury for civil and criminal trials is called voir dire. “Voir Dire” is a French phrase essentially meaning “to speak the truth.” This is the opportunity for the prosecuting and defense attorneys to size up potential jury members, and is the only time jury members will speak to the court during the trial. The jury pool will be randomly drawn from registered voters within the area of your jurisdiction. The pool will be much larger than the number of jurors actually needed for the trial, so most potential jurors will not be selected for the jury. In a recent trial in Lafayette, Louisiana where I was the criminal defense attorney, we had approximately 70 potential jurors for a 12 member jury. The reason the pool is so large is to ensure that the final jury is competent to make a decision and will be fair to both the prosecution and the defense. The first thing that will happen is that the judge will ask some basic questions to make sure that all potential jurors are qualified to serve. This can include questions about criminal records or medical conditions that would prevent someone from serving on a multi-day trial. Once the court is satisfied that all members of the jury pool are competent and able to serve, the attorneys will have the opportunity to question the jurors. The attorneys will ask questions about the potential jurors’ backgrounds including occupation, family members and spouse, education level, etc. They are trying to get to know the jurors and to find any hidden prejudices that might negate the possibility of a fair trial. For example, if a potential juror for a criminal trial was the victim of a similar crime in the past, he or she may feel prejudiced against the defendant. Or a member of the jury pool for a personal injury trial could have a husband who works for an insurance company which could sway them to favor the defendant corporation over the plaintiff. Each attorney has a number of “preemptory challenges” they can use to remove a potential juror. Preemptory challenges can be any reason, provided that it’s not based on race. In Louisiana, each attorney is entitled to 12 preemptory challenges. In some cases, when the judge feels that a potential juror cannot be fair, the judge will remove the person from the jury pool “for cause.” For example, in the trial I mentioned above, we had one gentleman on the jury who expressed his disdain for the judicial system – he though that both sides were trying to win and therefore he couldn’t trust either side –the defense and the prosecution. The judge directly questioned the man about his feelings, and the man admitted he could not be fair in trial. Excusals “for cause” are made by the judge and are not considered part of the preemptory challenges. Once the judge has decided the potential jurors are fair and competent, and the jurors have answered the attorneys’ questions, the attorneys will use their preemptory challenges to remove people they feel will not be sympathetic to their client or case. The large pool is reduce to a jury of 12 members, in most cases, but sometimes may be 6 members. The purpose of voir dire is to search for a fair and competent jury for both the defense and the prosecution. If somebody holds a secret prejudice against any party, for whatever reason, that person should be removed from the jury pool. Under the United States constitution, each citizen is entitled to a fair trial and the ability to pick jury members who will come into the trial with an open mind is vital to that right. Jury selection is a skill learned through practice — that is why it is important to hire an attorney with significant jury trial experience to ensure that you have the fairest jury possible for your case.